This Dual Power Automatic Transfer Switch is compatible with Sigineer Power’s Inverter Chargers. It works with two sources of 220Vac AC input, utility power and generator power. When the prioritised source of power is cut off, the transfer switch will automatically transfer to the backup power source. Max capacity, 63A at 220Vac. Not for 120Vac system. This Dual Power Automatic Transfer Switch is best option to integrate both utility power and generator power as backup power for the Sigineer Power Inverter Chargers. You can prioritize one power input over the other, in the event of a power failure in the first power source, the transfer to the backup source will be made in a few seconds. The switch can’t turn on or turn off the generator, but our Auto Gen Start terminal on the inverter charger can turn on and off the generator. Rated: voltage 220 230 240V 50/60HZ, single phase or split phase. Not for 120Vac system. Noted: power will be interrupted in Switching. 1. Dual power Automatic transfer switch can switch to Normal power or backup power automatically. 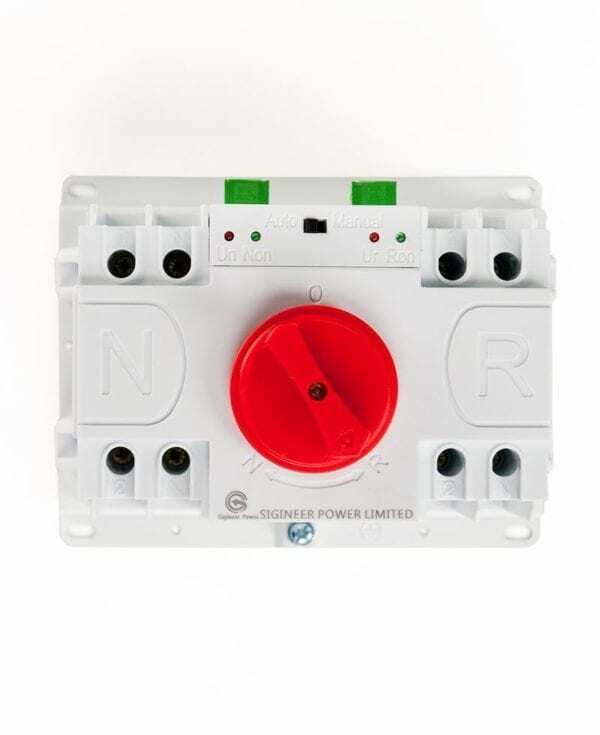 Press the button to Automatic, the switch will switch to Normal power or backup power automatically. Press the button to Manual, Then you have to rotate the middle switch manually to choose a power input. This is terminal type automatic transfer device. It’s suitable for single phases or split phase 2 wires dual power grid with AC 50/60Hz, rated voltage 230V and rated current up to 63A. When one power goes wrong ,it will automatic connect one or several load circuits from one power to the other power automatically, to ensure normal power supply of load circuits. Installation site is not more than 2000 meters above sea level.